Once upon a time the Right Bank was a dismal place to eat out. It was even worse than the UK. Pomerol might have been studded with famous châteaux, but try buying a measly croissant...it was harder than finding a legit bottle of 1991 Petrus. Nobody ever ate out in Pomerol because there was nowhere to eat except the Libourne branch of McDonalds, and trust me, it does not boast the best wine list in the world, so Saint-Émilion it had to be. There were only two choices: blow a large hole in your wallet at La Table de Plaisance or make do with poulet fermier et pommes frîtes at trusty bistro L’Envers du Décor. It was usually the latter and in any case, there was always a good atmosphere, a burning log fire, decent grub and Alain Vauthier chatting to Jean-Luc Thunevin in the corner. Thankfully the Right Bank has come a long way in culinary terms. Pomerol has the consistently excellent La Table de Catusseau, currently earmarked for a future Vinous Table. The Plaisance still caters to millionaires – far too posh for an Essex rake. Its owner, Gérard Perse, bought L’Envers de Décor a couple of years back and reopened it as a bistro. I await to see whether it has retained post-refurb charm. Fortunately, Saint-Émilion’s restaurant scene has blossomed with numerous places to dine, and yet one restaurant soars above the rest – Logis de la Cadène. I have frequented this restaurant for a long time both before and after its acquisition by the de Boüard family, and give credit where credit is due. The owner of Château Angélus got everything spot on when the restaurant reopened. The de Boüards could not change the restaurant’s enviable location in the heart of medieval Saint-Émilion, tucked down one of its steep cobbled arteries. The vertiginous walk down to the entrance is just a few metres, but my advice to ladies and men in touch with their feminine side – wear your trainers and change into your high heels once inside. The restaurant looks cozy and inviting, with its large vine-clad pergola accommodating those preferring to eat al fresco, and a discretely designed interior with a few luxurious rooms upstairs. The de Boüards make the place feel reassuringly “posh” but also welcoming – upmarket, but not self-aggrandizing. That is a tricky feat to pull off. The waitresses are all smartly dressed and helpful, while the sommelier team is willing to guide, but not pressure, you towards more expensive bottles. Of course, what matters is the food. For me, food hits the sweet spot when I pay more for the food, but it is not outrageously expensive, and the dishes more than deliver for the price. Chef Alexandre Baumard is clearly a talent. 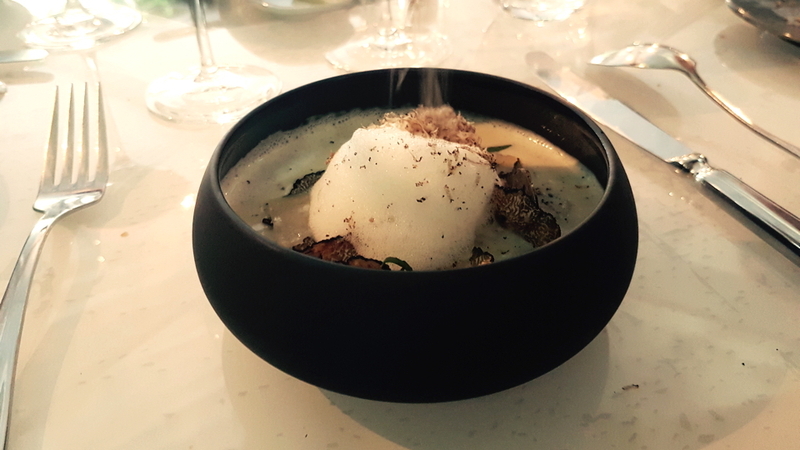 Where Logis de la Cadène gets my approval is not just in the detail and presentation with respect to the main dishes, but the exquisite quality of the amuse-bouches and pre-desserts. I think of them as “free extras”. When a kitchen has clearly put so much effort into these surprises, you finish the meal feeling as if they pushed the boat out to ensure gastronomic contentment and went above and beyond what was required. I opted for the “Menu Signature” at €75 per person, which also comes with a wine-pairing menu at €140 per person. The amuse bouche commenced the meal in style and was followed by the small white dish of drum fish carpaccio with sour condiments including a ginger-carrot sorbet, a wafer-thin beetroot meringue and a sea asparagus foam. In many ways it was the most daring combination of the entire night, but when mixed together and popped in your mouth, it resulted in a riot of flavours: refreshing, palate-cleansing and revivifying. This came with orange cream and pistachio “lollipops” inside which we found foie gras, served alongside cocoa bean and black truffle cromesquis. We decided to push the boat out with an additional course of Perlita caviar from House of L’Esturgeonnière with the obligatory champagne. Simply served with blinis, the caviar was tangy and texturally right on the money. 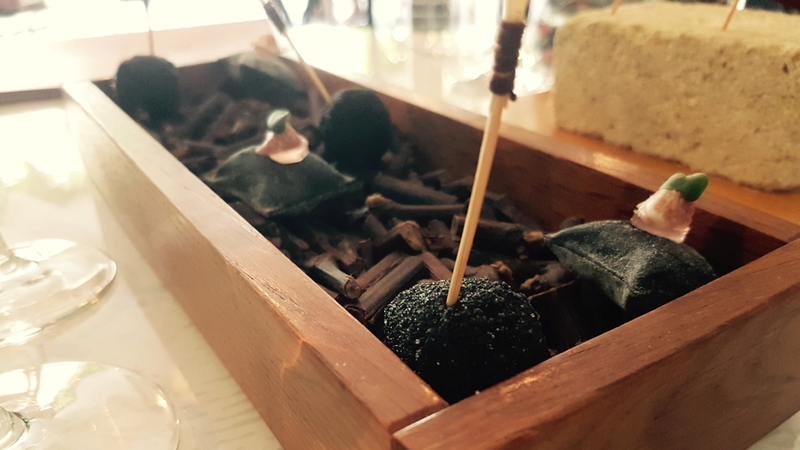 For starters, I chose the Truffle “Tuber Aestivum” that was shaved upon a bowl of risotto with Parmesan. The “Tuber Aestivum” is a summer truffle, as opposed to the “Burgundy truffle”, and is said to be less aromatic and slightly fleshier. I confess to order the same starter EVERY time I dine here because it is off-the-scale delicious. It is simple but utterly perfect, belly filling and dangerously addictive. The kitchen serves just enough to put a big fat smile on your face without leaving your belly protesting at the indigestible sphere of expanding glutinous rice. 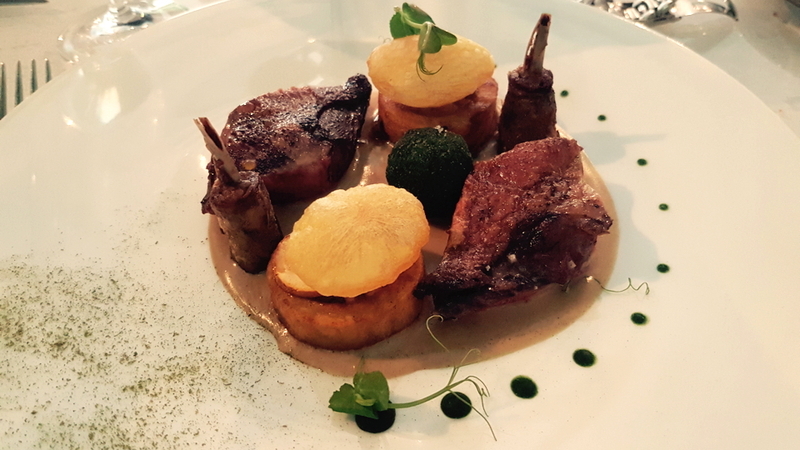 For the main course we had squab from the revered supplier, Marie de Guen cooked three ways (breast, confit of leg and cromesqui with liver) served with cep-stuffed potatoes and amanitas of Caesars, in parsley oil. My pigeon was medium rare, pink and perfectly tender. The confit of pigeon sucked off the tiny leg bone like a lollipop and oh so more-ish. Everything was perfectly seasoned, likewise the potatoes melted in your mouth. The pre-dessert, a Norwegian omelette with melon-lemon sorbet, red berry coulis and badiane sorbet, was a cool and refreshing dish that wiped the palate clean and prepared it for the actual pudding. 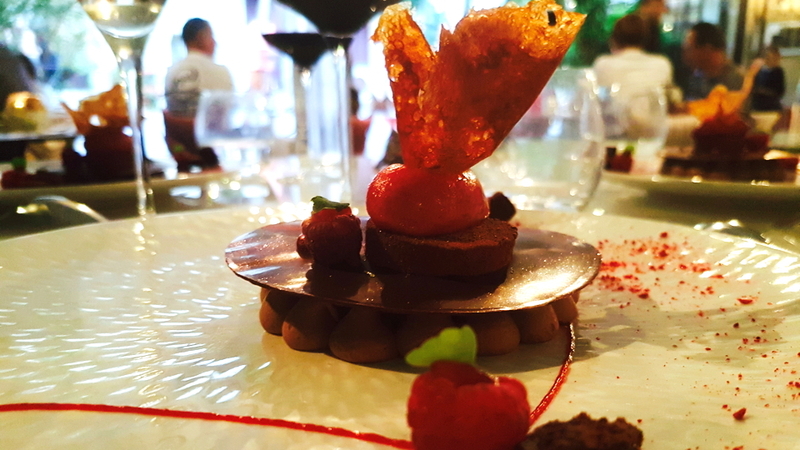 Again, I went for the obvious: the intricately designed and stunningly presented chocolat, pannacotta Heart of Guanaja on a raspberry puffed rice pie, Manjari raisin ganache served with a light infusion of hibiscus flower, mousse and raspberry sorbet. This was magnificent, not just in terms of execution, but achieving that crucial balance between sweet and sour, and in terms of texture, balance between the smooth chocolate and a slight crunchiness imparted by the rice pie. You simply could not improve this dessert. The wine list is faithful to the Old World more than the New, obviously centered upon Saint-Émilion, commencing with multiple vintages of Château Angélus. I wanted to keep within budget. Caviar and champagne are one of the handfuls of food and wine matches that I approve of. 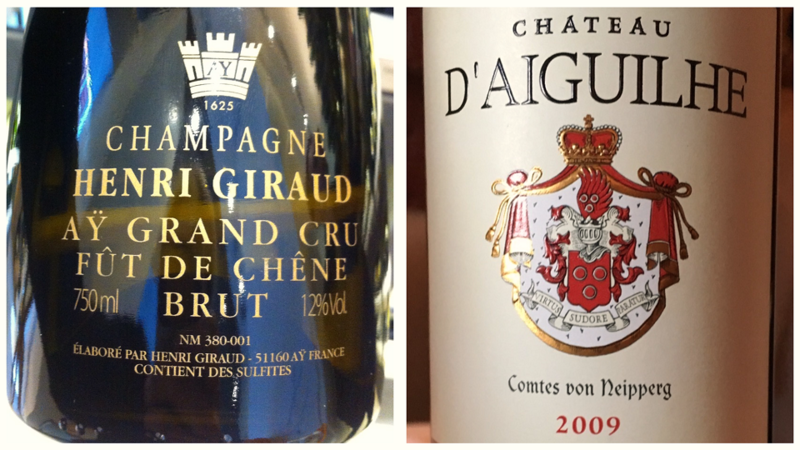 We enjoyed the Non-Vintage Aÿ Grand Cru Fut de Chêne Brut from Henri Giraud (2012 base). The Pinot Noir really defines this outstanding Champagne, quite rich and nutty on the nose with hints of brioche, whilst the palate is deep and quite rounded. If you are seeking a tense, livewire champagne, this is not for you. It is almost sumptuous in style, the oak discretely used with touches of baked bread and hazelnut towards the finish. For the rest of the meal we polished off an excellent and well-priced 2009 Château d’Aiguilhe since I do not often encounter Stephan von Neipperg’s Côtes de Castillon with maturity. Deep in colour, the 2009 has a gorgeous bouquet that probably reflects the growing season more than the terroir: scents of black fruit, black olive, a little iodine and just the right amount of comforting alcohol warmth. The palate is full-bodied yet balanced, with rounded clove-infused black fruit and a light black truffle note on the glycerin-rich finish. The 2009 might actually be a year away from its peak; it is one of those wines that go for the sensory jugular rather than the intellect, and why not? Saint-Émilion is packed with visitors throughout much of the year as you expect from one of the most idyllic and unspoiled villages in Europe, perhaps, something I take for granted given my familiarity with the region. Any visitor should go straight to Logis de la Cadène to experience fine dining without shelling out an obscene amount of money (unless you really are craving that Petrus). Observing the clientele on a warm evening, I admired how the restaurant caters to both those who have dressed up , without the stuffiness and haughtiness that puts an increasing number of people off. To state it another way, the waiters’ shirts are clean, but not overly starched. The adjacent tables were occupied by a family with two young boys and a couple with two miniature Scottish terriers begging for tidbits. The atmosphere was filled with enjoyment, laughter, delicious food and fine dining without the stuffiness. What more could you possibly want?